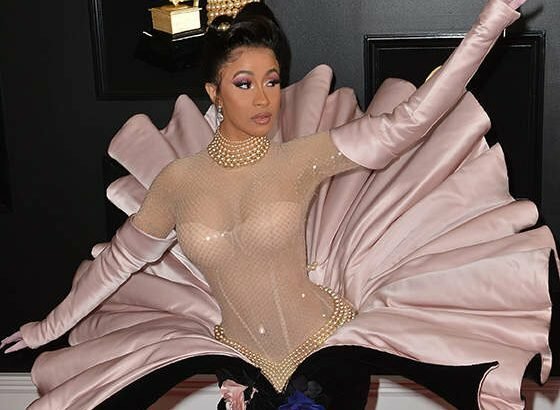 Variety is reporting that last night at the Grammy Awards, Belcalis Almanzar aka Cardi B, became a big winner. And I don’t mean because she managed to get that mutant threeway Disney baby of Ursula from The Little Mermaid, Babette from Beauty and the Beast and Yzma from The Emperor’s New Groove out of the Thierry Mugler archive to waddle down the red-carpet in. Cardi also became the first solo woman in Grammys history to win the award for Best Rap Album. Technically the first woman to win Best Rap Album was Lauryn Hill back in 1997, who won as a member of the hip-hop group Fugees, alongside Wyclef Jean and Pras Michel. But Cardi is the first solo woman to ever take home the trophy. Cut to Nicki Minaj in the Queen Radio studio cry-screaming over an endless barrage of gunshot sound effects. Can’t wait for Cardi B to come out with her own line of online merch with the slogan “Cardi B Stole My Grammy”.